Communication is central to managing situations in any hostile environment, be such in the military sphere, in response to an emergency, or when dealing with a major disaster. Must-haves for communication solutions in hostile environments are reliability, robustness, security, portability and ease of operation. Communications for these situations have been based on radio, satellite, and civilian infrastructures where they exist. New satellite communications technology, particularly picocell backhauling, provides exciting new opportunities that either augment or replace traditional solutions. Colonel David C. Uhrich is the Vice Commander, Military Satellite Communications Systems Wing, Space and Missile Systems Center, Los Angeles Air Force Base, California, and has served in that capacity since September of 2006. He directs acquisition planning, programming, budgeting and operational support for a $46-billion portfolio for military satellite communications systems including the Milstar constellation, the Defense Satellite Communications System, the Wideband Global Satellites Program, the Advanced Extremely High Frequency Program, the Transformational Satellite Communications System Program, the Global Broadcast System Program, the Command and Control System-Consolidated Program, associated Air Force communication terminals and mission control systems. Mr. Canty joined the former Hughes Space and Communications Company in February of 1984. Prior to assuming his present position as the Director of DoD Systems of Space Systems for the Intelligence and Information Systems portion of Raytheon Company, he was the Raytheon Six Sigma Champion and Expert for Space Systems in the Strategic System business unit of Raytheon. early in his career at Hughes Space and Communications, he successfully managed complex space systems integration, test and launch activity as Operations Manager and Test Director. He has managed the analysis group for Hughes New Venture Organization, successfully led the 350-person product line at Hughes through 2 years of 140 percent annual growth, and he won the Future Imaging Architecture Mission Control System (FIA MCS) program as the Capture Manager. The U.S. Air Forces Military Satellite Communications Systems Wing was established in August of 2006 and is located at the Los Angeles Air Force Base (LA AFB) in El Segundo, California. They also have an operations located in Alexandria, Virginia and Colorado Springs, Colorado. All terminal programs are executed by the Electronic Systems Center at Hanscom AFB , Massachusetts and the Space Logistics Group in Colorado Springs, Colorado maintains the MILSATCOM terminals. Within MCSW, there are five Groups, and one squadron and four Wing staff agencies. At MCSW, these folks deliver three primary Satellite Communications (SATCOM) product lines. These include the Protected Communications Group, the Wideband Communication Group and the Transformational Satellite Communications System (TSAT). Satellite Network Acceleration, Not An OptionEssential! Once viewed as an ad hoc addition to the occasional Department of Defense (DoD) satellite network, acceleration technologies are no longer considered optional. They are an essential component in modern military satellite architecture. Todays satellite programs RFPs specify acceleration in absolute terms, with interoperability and standards compliance at the forefront of program requirements. Military personnel cannot afford to lose connectivity at any moment. Whether cruising on the seas, flying through the air or traveling across the battlefield, high speed, reliable, always-on connectivity is imperative to their success. Increasingly, the military is turning to satellite communications for these critical needs. Science fiction may now have become science fact. A new technology for halting launch vehicle failures and on-orbit satellite failures is available. Prognostic is a term used when describing proactive diagnostics or failure prediction technology for satellites and launch vehicles. Dr. Len Losik, as the Global Positioning System (GPS) Telemetry, Tracking, and Control (TT&C) subsystem engineer, developed this technology between 1978 and 1984 to ensure the project received full funding from the Department of Defense (DoD). The Advanced Extremely High Frequency (AEHF) System is a joint service satellite communications system providing global, secure, protected, and jam resistant communications for high-priority military ground, sea, and air assets. The system consists of three satellites in geosynchronous earth orbit (GEO). These satellites provide 10 to 100 times the capacity of the 1990s-era Milstar satellites. A constellation of three AEHF, augmented by a Transformational Communications Satellite (TSAT), will provide continuous 24-hour coverage. Advanced EHF will allow the National Security Council and Unified Combatant Commanders to control their tactical and strategic forces at all levels of conflict through general nuclear war and support the attainment of information superiority. Earlier this year, international satellite communications solution provider, NSSL, sponsored a crack team of Royal Navy personnel from HMS Endurance, the Royal Navys Antarctic ice patrol ship, as they attempted to set a world record by kayaking around James Ross Island, off the coast of Antarctica. The island is 65km in length and is named after James Clark Ross, the explorer, who first sighted the island in 1843. 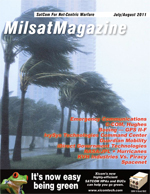 This issue offers a superb lineup of articles with a focus on the military side of satcom.